Natural source of iodine, bromine and vitamin B12. Rapidly recovers hair and coat growth, as well as their natural colour intensity. Universal drug for animals and birds. Laminaria and seaweed provide significant growth promotion properties, normalize metabolic processes, improve hematogenesis, promote immunity improvement and hair and coat growth, reduce cholesterol blood level, normalize digestive system activity and excrete heavy metal ions. Broad-spectrum action is caused by natural vegetable-based biologically active substances including carotenoids, phospholipids, chlorophyll, glycolipids, porphines, more than 20 amino acids, macroelements (potassium, calcium, magnesium, iron), microelements (iodine, cobalt, copper, zinc, manganese, sulfur, argentum, selenium, bromine), А, D, Е, С, К, РР vitamins, vitamin B complex and others. Recommended in environmentally unfriendly conditions, stresses, thyroid diseases, hypertonia, enterocolitis, coprostasia and vitamin-mineral impairment. 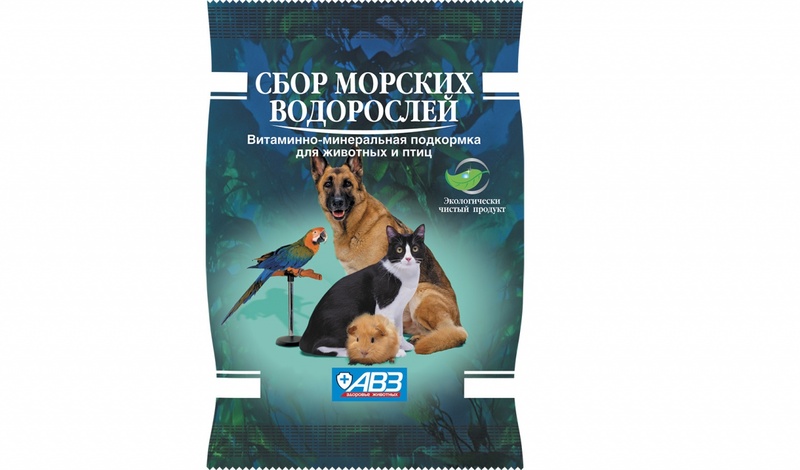 For cats, dogs, rodents and birds. Add feed supplements to animal feeding once a day within 15-30 days, then 14 day break is required. Feed supplement dose: dogs, cats and rodents - 0.5-0.8 g per 1 kg of body weight, parrots, canaries and other singing birds - 0.5 g. Note: 1 tea spoon contains 6 g of the feed supplement. Adverse reactions after the feed supplement administration are not described.